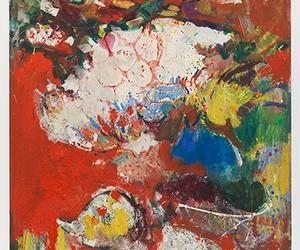 In a season dominated by group shows, here's a nice solo show of Hans Hofmann's work. Hofmann, the German-born and later New York-based artist, is best known for his abastract paintings that feature layered geometrical forms against non-figurative backgrounds. Having been one of Harold Rosenberg's favorites, he quickly achieved fame and went on to inspire many more. This show should be a nice, light survery of a big-name artist at a time when many other galleries have turned over their spaces to lesser-known artists. Ameringer | McEnery | Yohe, 525 West 22nd Street, 6-8 p.m.